This matador inspired velvet jacket by Zara makes quite the statement, and both these lovely ladies have embraced its spirit! Tall drink of water, Sidra keeps her look casual, pairing her jacket with classic skinny jeans, a voluminous blow dry and blingy matching heels. Meanwhile, Rushna goes for a bolder look, opting for matching velvet pants, giving her an inch up on the competition. 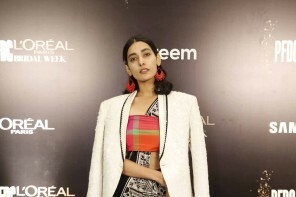 While both ladies went with fun gold clutches and let the jacket be the star of their ensemble, we have to give this one to Rushna for her daring and bang-on-trend choices!